Please arrive early enough to register with Hash Cash. 여유있게 도착 하시여 점심 식사비를 등록하여 주시면 감사 하겠습니다. 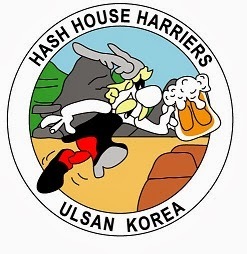 The Ulsan HHH was founded by Jim Ferman & George Ferrier on 10th April 1988. We meet every second Sunday outside the Seobu Foreigner Compound's Clubhouse.